What do you do if you can't eat gluten, dairy, eggs, or nuts and you love dessert? Your options are quite limited unless you bake everything yourself. 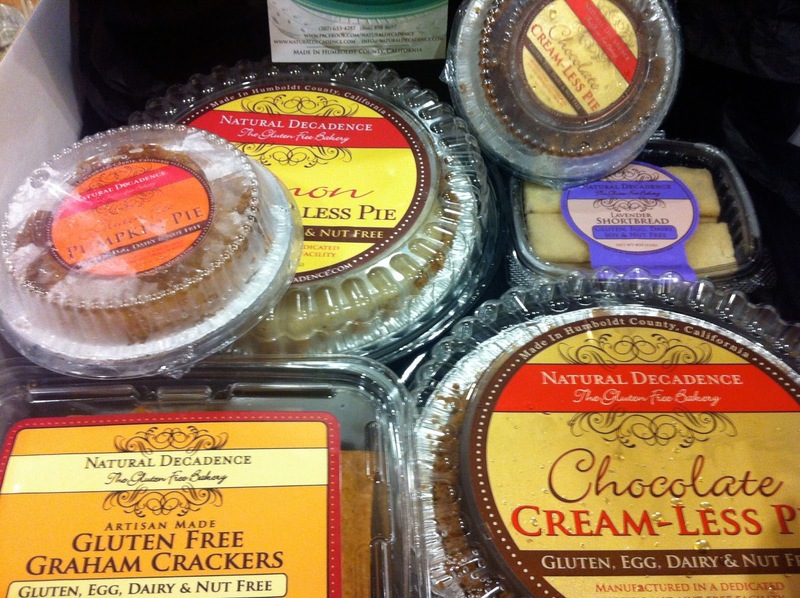 But now, you can buy pies and cookies that are free of those allergens and still taste amazing. 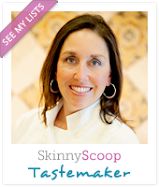 Rosa May Dixon, the head chef and co-owner of Natural Decadence, has a daughter with Celiac so she's truly tuned in to the demands on a gluten-free mom. The other owner, Milia Lando, has been a business owner in the health and wellness field for the last 15 years. In 2011 it became necessary for her to become gluten, egg, and dairy free for health reasons. Rosa's story sounds like my own; a passionate chef who is forced to take another path due to the diagnosis of a child. However, mine was not as extreme. Her young daughter, Solea, was constantly sick, throwing up on average 17 times a day. At first she was diagnosed with failure to thrive, then misdiagnosed with cystic fibrosis. Exhausted and looking for an answer, Rosa and her husband traveled from Northern California to Stanford to meet with Dr. Kenneth Cox, the chief of the division of Gastroenterology. Cole was able to quickly confirm that Solea was celiac. She was 15 months old and in the 1 percentile for her age and weight. Within three months of the diagnosis and a complete change in diet, she was in the 87th percentile. Unfortunately, any contact with flour or regular gluten products that Rosa brought home still was an issue for her daughter; her skin reacted from the contact. Rosa was about to end her catering business when she reconnected with, now partner, Milia Lando who had just been diagnosed with food allergies as an adult. In addition to wheat, Milia had to cut dairy, egg and nuts out of her diet. Rosa says "With my background in making pastries, Milia was encouraging me to create artisan products that were dairy, egg, nut, and gluten-free. At the time, I was really done with cooking professionally. But Milia can be pretty convincing, so after a few months we tested out some recipes and began focusing on wholesale. 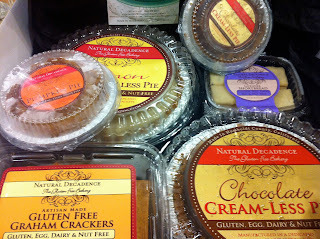 We started with one flavor pie in our local co-op in Arcata." Not surprising, they were a fast hit around their hometown of Humboldt and were discovered by Harvindar Singh, Whole Foods' food forager. A year later, their pies - Lemon, Pumpkin and Chocolate - are now in Natural Grocers throughout Northern California, including 25 Whole Foods. My family was able to try all three pies, available in small and large sizes. All I have to say is that there was some serious negotiations happening at the table. The pie crust is more like a graham cracker but that didn't stop my kids from gobbling up these delightful desserts. The fillings are like a smooth pudding and taste very fresh and natural. A line of cookies, shortbreads and graham crackers (which we tried and loved) will be available soon. My 7 year old gives the lavender shortbread a big thumbs up. I was hoping maybe she wouldn't like those. You can get a full retail list here. Look for it in the freezer section. Don't worry; most of the items will thaw in 5-60 minutes, depending upon the size. I hope you will give them a try. There are a lot of gluten-free and dairy-free desserts out there that people could not pay me to eat; they are tasteless and dry. This is certainly not the case with Natural Decadence.